For years — probably too many years — my quintessential summer album was New Order’s Brotherhood. Nothing sounded more like tossing frisbees or sprawling in the grass with friends or making out on a blanket under the stars. For the last several years, though, I’ve made self-conscious attempts to identify what I think of as my new-release album of the summer — not the infectious, hear-it-wherever-you-turn song of the summer, which in the case of 2006 was clearly Gnarls Barkley’s “Crazy” — but an album that evokes the same seventeen-year-old feelings New Order had, something I would have worn out by September if I’d purchased it on cassette. Last year my two choices were both come-down CDs, things I liked to put on at the end of the night: Feist’s Let It Die and Sam Prekop’s Who’s Your New Professor? This year I spent a good chunk of the summer in a rental car, mastering LA’s freeways as I commuted to my research gig in Pasadena or zipped (sometimes crawled) between many fine friends’ houses (often down the 710 or 405 from Hollywood or Silver Lake toward Long Beach late at night). One byproduct of this driving ritual was that I spent more time than usual listening to full CDs rather than to my alphabetically ordered iPod. Albums! Remember those? Ten songs or so from the same artist, artistically sequenced for an overall effect? Maybe it was the diversity of locales, contexts, and company I enjoyed this summer, but I’ve only been able to narrow my choices this year to three, each of them tailored for a slightly different ride. 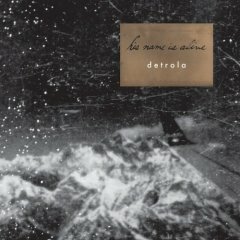 My overall album of the summer, the one I returned to more than any other and in more moods, is Detrola by His Name Is Alive (Silver Mountain/Reincarnate, 2006). Technically this isn’t a summer album. It came out in January, and I first stumbled onto it sometime back then, dragging-and-dropping it onto my iPod along with a bunch of other stuff. But given my listening habits I only heard its songs one at a time here and there, at least until a couple stunning piano-driven tunes that could have been written by Harry Nilsson and performed by Karen Carpenter — “Mama Don’t You Think I Know” and “Summer Left Your Heart Behind” — drew me into the album as a whole. For most of HNIA’s history the eclecticism has accumulated one album at a time, but on Detrola, the band’s first album in four years and its first post-4AD, the whole range of genres, instruments, and vocal stylings turns up in a glorious mess that holds together surprisingly well. The sea-shanty fiddles of the “live” opener, “The Darkess Night,” share space with electronics that will move to the fore in the Broadcast/early-Human League synth pop of “Sometimes Screw” and “Here Forever Always.” They surface again in the Close Encounters morse-code coda to what could otherwise have been an acoustic folksong closer, the haunting duet “I’ll Send My Face to Your Funeral.” Weaving and bobbing this way, the songs on Detrola don’t so much represent individual genres as they blend and recombine sounds, folding melodies and styles back over one another like threadbare blankets that, despite the icy breeze from Defever’s lovelorn lyrics, somehow manage to keep you warm. so it’s kind of wacky, but tonight i played “mama don’t you think i know” at record club and i realized that on the actual CD all the songs have different titles than they do when you plug the CD in and iTunes calls up the track info from the big database in the sky. each song has two titles? how do you know which one is the “real” one? rather than posing a dilemma, though, i think the situation underscores a point i made above about tracks folding back on themselves. i don’t think they begin and end — or have individual titles — as much as they bleed into and inform one another. all you jonis and chachis who aren’t listening to this disc need to get your butts to the record store so you can see what i mean. Okay okay. You’ll be happy to know, Bryan, that it just catapulted through my mail slot due to your exhortations. Will praise you later after I fall in love with it. ooh. you are nothing if not obedient, stephanie wells. damn!